Metal Heat Treating & Hardening | Snyder Industries, Inc.
Snyder has its own in-house metal heat treating and hardening division which allows for further control over quality and production. Computer controlled atmospheric heat treatment is another beneficial aspect of Snyder Industries / Great Lakes Metal Treating. Two Surface Combustion AllCASE Batch Integral Quench Furnaces, each with a capacity up to 4,000 lbs, perform treatment processes such as normalizing, stress relief, oil quenching, annealing, carbon restoration and gas carburizing. The furnaces operate under an endothermic atmosphere which yields treated parts with extremely clean surface finishes to ease the subsequent final machining processes. 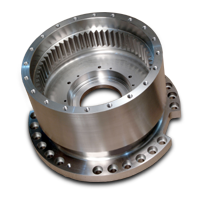 Presently processes have been developed for treating numerous alloys in various shapes and sizes. ‘Stop-off’ paint can be applied to protect from unwanted treatment on particular surfaces. As a branch of Snyder Industries Inc., Great Lakes Metal Treating was created to utilize today’s new technologies. The Induction department hardening is no exception. 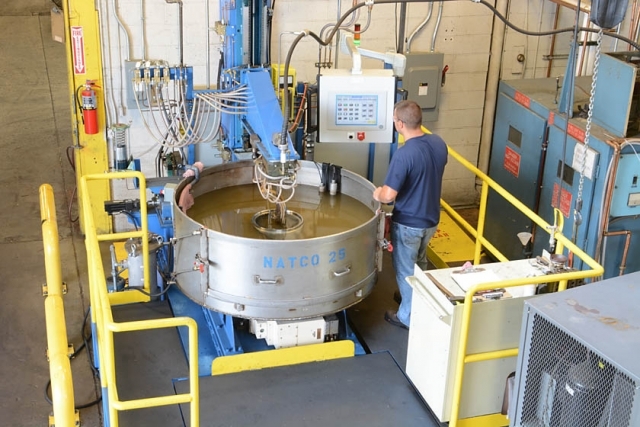 Within this department there are four NATCO induction hardening machines; three horizontal and one vertical. There is also one Inductron II TOCCO induction hardener. NATCO uses the Delapina method by submerging the gear teeth under the quench to allow an instant quench for maximum hardness and minimal distortion. NATCO has the range to perform from a 2 pitch to a 6 pitch gear, due to the ability to vary frequency from 150 KHz to 300 KHz with a power of 25 KW. All of Snyder’s vertical Natco machines are equipped with Allen Bradley PLC Compact controls which enables for precise and consistent case depths. Effective case depths of up to .250″ with a hardness of 60 HRC can be achieved. TOCCO uses a 10 KHz frequency with an output current of 200 KW. This process can reach up to .375″ in case depth with a hardness of 58 HRC. Each machine is programmed to specifically meet the customer’s request. Before an order is processed, a sample is run, then cut and analyzed to assure the required specifications are met. We can harden gear teeth precisely to the depth required. We are the complete machine shop, this allows us to design and construct the fixtures and inductors to harden our customers’ parts. All metallurgical analysis is performed in-house by our trained technicians. 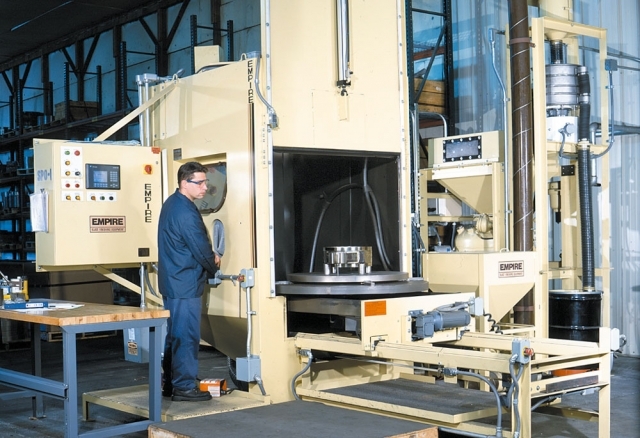 Also included at the Snyder Industries / Great Lakes facility is a computerized Empire Abrasives shot peening system, where steel shot is used to meet the design requirements of the customer under accurately controlled settings. Hardened gear teeth and specified areas of the machine part are peened to increase fatigue strength and life of the gear. An Almen strip test is used to verify the intensity for each job order. Our shot peening process is certified to the Mil standard 13165-C.